The Soreq Nuclear Research Center is a research and development institute situated near the localities of Palmachim and Yavne in Israel. 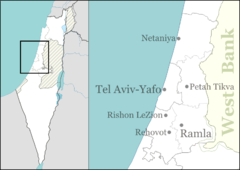 It operates under the auspices of the Israel Atomic Energy Commission (IAEC). The center conducts research in various physical sciences, particularly the development of many kinds of sensors, lasers, atmospheric research, non-destructive testing techniques, space environment, nuclear safety, medical diagnostics and nuclear medicine. It also produces various types of radiopharmacuticals for use by health care organizations throughout the country. Some of the institute's research facilities include an AMF 5 MW pool-type light water nuclear reactor supplied in the late 1950s from the United States under the Atoms for Peace program and a 10 MeV proton cyclotron accelerator, as well as extensive laboratory and testing facilities. Currently under construction is a 5-40 MeV, 0.04-5 mA proton and deuteron superconducting linear accelerator scheduled for commissioning in 2013. Noted American modernist architect Philip Johnson designed the center's building in 1956. The project was Johnson's first government commission. ^ "Nuclear Research Center - Soreq". Israel Atomic Energy Commission website. Israel Atomic Energy Commission. Retrieved 22 January 2016. ^ "Philip Johnson Was Very Nazi. So What?". Tablet Magazine. 2018-12-05. Retrieved 2019-04-04.